DURING the latter part of the turbulent reign of John, king of England, Sir Roger de Stevenson became the guardian, appointed by that sovereign, of the young Henry de Bath, the orphan heir of the honourable house of Bathon, or Bath; whose principal residence, at that time, was Bath Hall, in the parish of North Tawton, Devonshire. On the estate, and within sight of the mansion, was a large circular pool, not very deep, but of such exceedingly pure water, issuing from some spring in the earth, that it was considered to possess a coolness, freshness, and an invigorating quality unequalled even in that county where rocky rivers, streams, and wells of every description are found in such abundance. It was said to be favoured and protected by the Pixies; who, according to tradition and the current opinion, delighted to sport on its margin, to sail on its tiny waves by moonlight (for Pixies are great lovers of moon-shine), and above all to make it their bath. Whether Pixies delighted in it or not, the poor certainly did so; and when the labourers were toiling in the fields during the harvest either for hay or corn, and got heated under a scorching sun, they would gladly come and slake their thirst at the Pixies' bath. The old, the feeble, or the very poor, who lived principally, if not entirely, by begging an alms at the doors of the monasteries, and of the rich, would hasten on their way, when within a mile of the spot, to drink of these cool waters; and to beg a morsel or a small piece of money at the door of the noble family who dwelt hard by. In order to accommodate these poor people an iron cup, secured by a chain, had been fixed to a stone seat on the margin of the bath; and this little act of charity had often brought a blessing from the lips of the weary and the traveller, on the kind hand that had bestowed it, as they drew a refreshing draught from the spring. During the minority of Henry de Bath, his guardian lived with him. Sir Roger de Stevenson was proud, covetous, churlish. He liked not to have his purse drawn upon, nor his pride and grandeur disturbed by the solicitations or the presence of the lame, the old and the ragged. With great cruelty, therefore, did he order the iron cup to be removed, thinking by so doing to hinder poor folk from obtaining water from the pool. But, strange to say, though this was twice done, the cup was found, each time, restored to its former place the next morning. Sir Roger was very angry, and though the servants, one and all, protested that they had nothing to do with it, yet he would insist it was their act and deed in opposition to his will. Accordingly he employed one or two of his own sturdy followers to remove the cup, and took it into his own possession, locked. it up in his strong oak chest, and put the key in his pocket.. But what was his surprise, when on the next morning he found not the cup, but his own iron basinet (a cap worn under a helmet) chained to the stone, and saw a ragged leper very quietly using it to help himself with water from. the pool! Sir Roger now raged. indeed!. His own basinet made the drinking cup of a filthy, beggarly, worthless leper (as he called the poor diseased man, who was taking a draught to slake his thirst), it was past bearing! He immediately called his hounds about him, went to the pool himself:, hissed and clapped his hands, set the dogs upon the suffering wretch, and drove him dreadfully frightened off the premises. The basinet was removed, and scrubbed and scoured and cleaned, as if it had been touched by a man who had the plague as well as the leprosy. This time neither the cup nor the cap were again found at the side of the bath. But though the affair of the dogs was much talked of, it did not keep away the people from the grounds of young Henry, or from the seeing and the hearing of his proud guardian, Sir Roger de Stevenson. Still would the labourer and the poor come to drink water out of the palms of their own hands for the want of the cup. Still would the children of the village follow their sports on the margin of the pool; still they delighted to swim in it their little play-thing boats; to throw the daisies they had plucked from the meadows upon its surface, and to see which way they would float. Still, so said the country gossips over their evening fires, as they roasted crab apples for their jugs of hot and spiced ale, still were seen little creatures, scarcely six inches high (dressed in coats and cloaks that glittered and sparkled in the moonbeams), skimming like swallows over the surface of the pool; and this might be seen of a summer, or even of a winter's night. And whilst they so sported, these little creatures were singing so sweetly, that the gossips who told the tale protested, that never in all their lives had they heard anything like it; never, neither when the minstrels played in the hall at Christmas, nor when they went to church, and there heard the country. singers, on festival days, helped by the pitchpipe. Some of, the young girls who listened to all this, said, that when going of a morning to milk the cows, or to look for the poultry, they had often found floating on the pooi, quantities of roses and rose-buds, and lilies, and that beautiful little flower called Eye-bright, which everybody in Devonshire knew the Pixies were particularly fond of. And therefore it was to be inferred those little beings must have been there on the previous night; for who else would take the trouble to dress up a pool of water after that fashion. But Sir Roger, who was one of those men who are so morose and moody, that they are neither happy themselves, nor like to see anything approaching to harmless mirth in others, took all this in a very ill-humour. He did not see why either men, women children, or Pixies, should have any enjoyment contrary to his wishes. He determined, therefore, to take such a course with the Pixies' bath, as none but a man so bold and having so much power would have dared to think of doing, he would have the bath destroyed altogether. In vain did his young ward pray that it might be spared, as the people on his estate and all the neighbourhood had so long been accustomed to see it, to drink of it, and to admire its reputed wonders, that the destruction of it would be very ill taken the country round. In vain did Sir Malpas, the good humoured and jovial parson of the parish, plead for it. Indeed it was said he loved it so well, that after he had made very free with the stout brown ale, at the hall, he always washed his face in, and took a refreshing draught from the pool, before he went to his own home, or ventured to scold his clerk, for taking a cup too much at the buttery hatch. The old nurses who had been accustomed to wash babies' faces in it, if they were girls, in order to make them grow up very fair, pleaded hard to have it left for their use. And the young women, so washed when babies, who on Midsummer eve, after performing certain rights and spells on the margin of the pool, looked with fear and awe upon its dark surface, in the hope to see reflected in it the faces of their future husbands, they also begged very hard to have it spared. But it was all in vain, Sir Roger was decided; the pool should be destroyed. It was said that the execution of his purpose was hastened by the following circumstance:--Returning one night to the hall when it was quite dark, as he passed near the water, he heard himself called after in the most contemptuous manner. These calls were accompanied by the strangest sounds, and a hissing and a clapping of hands, even as he had hissed and clapped his hands to set the dogs on the poor leper. And when he shouted and asked who was it so threatened him, the most violent peals of laughter seemed to issue from the pool, as if to deride him and his wrath. He was very angry, went instantly to the hall, procured lighted torches, and with about a dozen stout fellows at his heels, proceeded to survey the pool and the grounds about it, but could see no one and hear nothing; all was dark, silent, and deserted. The very next day he set to work, and in good earnest began the destruction of the Pixies' bath. But, for a time, never was there such a labour undertaken in vain. The men worked and toiled and worked again and again, and day after day, and all to no purpose; for the pool, emptied by night, was always found full in the morning. But not even this, nor the shaking of heads, nor the turning up of hands and eyes in wonder, nor the threats of the old women and the young ones, too, that Sir Roger would bring evil on himself and all who belonged to him, if he persisted, could make him change his obstinate determination. "When a pig goes the way his driver would have him," said Mabel, the good woman who had nursed Henry de Bath, "my dear young master's guardian will change his will, to go the right way instead of the wrong, but not till then. Sir Roger will be hard over our young master, John Butler, I fear, by and bye, when he comes old enough to like to have his own ways; and I'm sure they wont be those of his guardian. And I should not wonder if the Pixies dont some day drown him in their bath that he is so bold as to disturb; for, take my word for it, John Butler, Sir Roger will never be able to destroy it." John the Butler agreed to the same, and said it would be a mighty pity if he could, for the water from the bath made the best ale, when put to the malt and hops, in the whole county. At jest, after trying a variety of ways to succeed in this determination, Sir Roger was obliged to form an under-ground channel, and to carry the water that rose from the spring in another direction, so as to fall into a ditch that ran by the side of the public road. This method proved effectual, and nothing remained near the hall but a great, ugly, irregular pit, with a deep hollow in the middle. It was said, that the night before the waters were turned into .the channel thus made to drain them, the most dismal cries, shrieks, and groans were heard from the bath. Everybody now fell to abusing Sir Roger (behind his back) for what he had done, and even he thought the pit thus left looked very unsightly; so that he determined 'to have it filled up. Again the men went reluctantly to their painful toil; but so many mischances occurred while they were about it, that nothing for misfortune could be like it in all the world. One man broke his leg, another his arm. Every day, several tumbled head over heels into the deep hollow in the middle, and hurt themselves very much in the fall. One got a broken head, another a broken nose; and although working in a place so lately filled with water, the fleas swarmed in such abundance, that the men tore their very skin from their bones with scratching. At length, driven to despair by such a continuation of disasters and vexations, the poor fellows, one and all, begged Sir Roger not to put his faithful followers to such a task; it evidently exposed them to the terrible wrath of the Pixies. Had those little people been pleased to send a band of men to keep the workmen off the pit, they would not have cared for it; they would have fought man to man; but there was no fighting with Pixies; the only way was to leave them alone and let them have their own way. Sir Roger, finding that his men could really work no more, made a virtue of necessity, and pretended to yield his own will to oblige them. And so the pit was abandoned; it remained, as every body said, as ugly an old hole as could well be seen, and a disgrace to be near the mansion of such a noble and ancient family as that of De Bath. Unsightly and ugly indeed was the pit; but that was not the worst part of it; soon was it proved to have a terrible power of predicting evil to every member, however near or remote, of the family of De Bath. The first instance occurred during the month of August, and in so dry a summer, that rivers, and even wells, were, in many places, without water. One evening the pit was observed by the household to be so dry that the earth at the sides and at the bottom was full of great cracks, three or four inches asunder. The next morning it was seen, not only filled with water, but over-flowing at the brim, so as to be very inconvenient to those who passed near it on foot. Everybody was now startled, and feared something terrible was about to happen to Henry de Bath, or to the household. Should the ill luck fall on Sir Roger, in that case the bath would have over-flowed with joy to them all; for none liked, and all feared him. Even the young master of the Hall began to feel uncomfortable under the arbitrary rule of his guardian. He would have the power to free himself from his control, as soon as he came of age. But Sir Roger wished not to be called too strictly to account for what he had done with the property during the minority, so it kept him a little in check towards his ward; he was less tyrannical with him than with any one else; but still he was bad enough. The swollen bath now attracted the notice of all the neighbourhood. Many came miles to see the wonder; and most went away shaking their heads, and fearing some great calamity. At length, one afternoon, several men-at-arms were seen riding slowly up the avenue of old trees, towards the hall. They were covered with dust, their armour was dim, their surcoats soiled, they wore no visors, whilst their care-worn and sun-burnt faces told of foreign toil. They bore with them a torn banner, and a noble led war-horse, carrying on his back a helmet, a shield, and part of a broken lance. All this seemed to proclaim tidings of disaster. The leader of this little band of dispirited men stopped before the gate-house, and asked to see the youthful master of the household. Henry received him and his party in the great hall of the mansion; his guardian was by his side. "What is this?" said the youth; "surely, or I am much mistaken, the device of yonder torn banner--a cross, surmounting a crescent--surely it is the banner of my fair cousin, Sir Gilbert de Bath. He who, though not twenty years old, went with so gallant, so free a spirit, to take part in that crusade set on foot by the Emperor Frederick. Say, do I remember truly?" "Truly," replied the stranger; "and, now, most sadly--"
"Sadly! not so, I hope," said Henry, interrupting him. "How fares my cousin Gilbert? But you are silent. I fear the worst; a prisoner, may be, in Palestine. O gladly will I pay his ransom, so that the turbaned infidel will but take the gold. Sir Roger, I must have gold; aye, gold in plenty, to pay my dear cousin's ransom, and to give him back to liberty and to his country. My life for it, he fought bravely." He did, indeed," replied the stranger; "he fought bravely, and fell bravely. I was his esquire of the body. He loved you well, Henry de Bath. He thought of you in his dying moments. As he lay outstretched and bleeding on the burning sands before the walls of Jerusalem, which thrice he had attempted to mount in vain, he made me promise, that I would fulfil his wishes. That I would bring to you, with this torn, but still honourable banner, the tidings of his death; of his having met it with his face to the foe; and that, with his last breath, he sent you the assurance of his undying affection. I now fulfil this melancholy duty; here is his banner, here his shield and his broken lance. His noble, war-horse stands at your door; but there is no spirit in him. He is no longer fit to bear a gallant knight; for he no longer raises his head, or chafes at the sound of the trumpet." Young as he was, Henry de Bath was, nevertheless deeply affected at this melancholy recital. He kindly and courteously entertained the faithful esquire and his little band. The banner, the shield, and the broken lance, he desired might be hung up in the neighbouring church; and, before he retired to rest, he sent a purse of gold to the next monastery, and directed one hundred masses to be sung for the repose of his cousin's soul. He then retired, unattended, to his own chamber, and gave himself up to that strong and unrestrained expression of his grief, in which he would not indulge before his people. In the morning he rose early; but, early as it was, many of his household were stirring before him. They seemed to be in some commotion. Several were in the court-yard, talking to each other with grave looks and eager expressions; whilst heads were turned, and fingers pointed, towards the spot where, for many weeks, and even so lately as on the preceding evening, the Pixies' Bath had overflowed in so strange and mysterious a manner. There was now no water to, be seen in it; and the unsightly pit, perfectly dry, with its deep hollow in the centre, and all the cracks and fissures at its sides, remained just as it was before a drop of water had risen to cover it. It may well be supposed what a sensation this must have occasioned in the household at the Hall. All now understood what had been the object of the melancholy and fatal sign. The waters had overflowed like the sorrow of the survivors; their rising had foretold the death of Sir Gilbert. No sooner was that sad event announced to his nearest kinsman, than the waters were buried again in the earth, even like him whose fall they had foretold. Two or three months after, the same thing was repeated on the death of an old abbess, of the family, of De Bath, who for many years had been the lady superior of a convent of nuns, at Lanherne, in Cornwall. Five years more, saw young Henry of age, and free from the rule of his guardian. Before that time arrived (as he was more given to learning than to fighting) he had gone to London and turned his attention to the study of the law, which he followed with zeal and ability. Whilst he was so engaged, King John died, and Henry III succeeded to the throne. Here, then, for a while we must pause. The next chapter will treat of very different events to which all the foregoing were but as the prelude. THE youthful Henry, as it became the head of a family so ancient as that of De Bath, on coming of age visited the court of Henry III, and shortly after received the honour of knighthood from the king's own hand. He speedily rose into favour; for he was of a tall stature, a fine open countenance, courteous in his manners, and of a noble and generous disposition. This worthy and accomplished gentleman rose into such esteem with his sovereign, that, in a few years, after many distinguished offices had been conferred upon him, King Henry made him one of his justices itinerant, or judges who travelled to the large country towns, where criminals were tried for breaking the laws. His rise in the world had been rapid, but well deserved; and he now used the power he possessed, as an honest and a merciful man who had the fear of God constantly before his eyes. But unmixed good is not the portion of this life. The more Sir Henry became loved and honoured, so much the more was he hated by his late and always unworthy guardian. Though free from his control, yet such was the humility of his disposition and his sense of the authority formerly vested in Sir Roger, that he continued to treat him with all possible deference and respect. His house was still open to him whenever he pleased to make Bath Hall his home. How Sir Roger could find it in his heart to hate so good a man as Sir Henry seems almost incomprehensible, did we not know that bad men always hate good men, because the latter are as a reproof to them. Sir Roger, though he tried hard for it, could never win the sovereign's favour as his ward had done; and he burnt with envy towards him, and determined to watch an opportunity to ruin him with the king. Now it so happened that a follower of Sir Roger, from whose assistance he hoped much to carry on his designs against Sir Henry, refused to do his master's bidding; he would not be made the tool to work mischief. Seeing this, De Stevenson, in order to punish and degrade this honest servant, who had been one of his own pages, sent him down to a farm he had in Devonshire, and made him keeper of his sheep. The young man bore his degradation patiently; but he had never been bred to a farming life; and not knowing how to fold the sheep at night so as to keep them safe, the wolves, that were then not uncommon near Dartmoor, did great injury; and every night a sheep or two was lost from the fold. This was just what Sir Roger expected. He pretended, however, not to believe a word about the wolf, but threw poor Maurice into prison on a double charge; first, that of being connected with a gang of robbers, who made their home in a thick forest in the north of Devon; and secondly, accused him of supplying them with his master's sheep. False witnesses were bribed to support these unjust and wicked charges. Sir Henry de Bath was the judge appointed to the circuit which embraced the town where Maurice was left to be tried. Before setting out on his duty, he went to his own home in the country, and, whilst there, the wily and treacherous Sir Roger came to see him. Hearing on what business the judge was going, he wanted to tell him a false tale about the man who would be tried before him for stealing sheep, and supplying them to the robbers of the north of Devon. But Sir Henry only said in reply--"Did you ever learn, Sir Roger, when a judge must be deaf, and when he must hear with both his ears every word that is said to him?" "No," answered Sir Roger; "a judge should never be deaf." "O yes, but he must though," replied Sir Henry. "He must be deaf when the matter that is to come before him is spoken of out of court. But in the court he must have both his ears open, the one for the accuser, and the other for the accused; and he must hear both with impartiality and attention. Say no more, therefore, about your man and the sheep-stealing, for I have my deaf ears on now." Sir Roger was mightily vexed; but he could say no more. "Well, Sir Henry," he continued after a pause of a few minutes, "though you will not serve me in this matter, as I expected you would, yet I must serve you." "Say not so, Sir Roger," said Sir Henry; "I will serve God and you too, for I will endeavour to do justice between you and your man, when the cause comes before me." "Well, I am content," replied Sir Roger. "Now the thing in which I will serve you is this: the roads between here and the town of assize to which you are journeying are in very bad plight. You say that you set forward tomorrow; you will never reach the town ere nightfall. I advise you, therefore, as there is no convenient inn nor place of rest on the way, to go to the castle which you will see towards the evening to the right of your road, and there pass the night. The owner will not deny hospitality to a gentleman of your rank, nor to your followers." "Who is the owner?" enquired Sir Henry. "I do not know him." "He is Simon de Dinant, that baron of Norman blood you have so often heard of in these parts." "Is he not disaffected to the present king?" said Sir Henry. "A friend to the Earl of Leicester, who is stirring on the Commons so much against Henry?" "No," replied Sir Roger; "he has rather thrown the curb over Leicester, when, like an unruly steed, he would go too much ahead. Simon, the bold Baron of Dinant, is a friend and not an enemy to the King." "If so," said Sir Henry, "I will call at his castle gates, and crave the rights of hospitality, and a night's lodging for me and for my men. I thank you, Sir Roger, for giving me such good counsel how to proceed in these dreary ways and long journeys, for I am yet but new in this Western Circuit, and little know where to house with comfort or safety on my road." Soon after they parted, and each went to rest. Early the next morning, whilst the Judge was preparing to set out, the nurse of his infancy and his childhood, old Mabel brought him a bowl of milk, to refresh him before he went down to breakfast in the great hall on beef and ale. She seemed to be very officious about him, and to linger longer than she needed in his chamber. But Mabel was a privileged person. At last she thus began: "Has my Lord Judge looked out of the window this blessed morning?" "No, Mabel; I have been too busy. But what is there to be seen by looking out of the window, that you ask me the question?" "O my Lord, a terrible sight! It breaks my old heart to see it, and think of it. The Pixies' bath, as people call it, is full again and overflowing; and you are this day going away from home. O my Lord, what does that foretell?" "No harm, I hope, Mabel. I have no fears, at least none for myself." "O but I have for you! Remember, my Lord, how that terrible pool has twice before overflowed; and what it came to tell! And how, as soon as your near kinsman's death was known in this house, it went back again dry as it was before: but not so our eyes, nor our hearts; for the one had plenty of water, and the other overflowed with sorrow for poor Sir Gilbert's' death, and remember how before the decease of my good lady Abbess, your honour's great aunt--"
"I remember it all," said the Judge, "yet I must go; my duty calls me away; and I have no fears. But I have for you. And O," she continued, forgetting that she was addressing the man and the Judge, in the remembrance of how tenderly she had nursed and loved him when a babe and a child," and O do not go from home to day, or something fearful may happen to my own dear boy, my poor little Henry." The Judge smiled. "Good old Mabel," he said, "go I must, for I cannot tarry here. But to quiet your apprehensions, I promise you to be very careful of myself in all I do, and wherever I go. I hope that I depart on a good errand, with a wish to do right and act justly; and so I have no cause for alarm." "But O, as you value your life, don't go with that Sir Roger," said the nurse, "he who behaved so bad to the Pixies. Depend upon it, they will take their revenge upon him one of these days, and not care for who is in his company. Don't go with him!" "I am not going with him, Mabel." "Thank all the saints for that; but where are you going, my Lord?" "To hold the assize at Bodmin; and, to avoid the band of robbers who are so strong in the woods, and create so much terror in these parts towards nightfall, I am going to beg hospitality of the Baron de Dinant, and hope this night to rest at his castle." "The Baron de Dinant!" exclaimed the old Nurse. "Don't go near him, my Lord; better to take the risk of the robbers in the open road, than to darken the gates of Simon de Dinant. People do tell such things of him. They do say he be leagued with worse than robbers--traitors to the king, and that no good comes to anybody who goes near him, and that your guardian is deep in all his plots and ways; do not go to him." "You are mistaken, Mabel, what you report is nothing more than idle country tales. My late guardian has too much respect for me to wish me to risk my safety, or my character, by advising me to take shelter under the roof of a suspected Baron. There is nothing to fear in the course I am about this day to pursue. And again I tell you that I fear nothing." Mabel shook her head, looked grave, crossed herself, but seeing she could do no good by her advice, she told the judge that she would go and offer up, with her prayers, a candle for his safety, at the shrine of St. Ann in a neighbouring convent of nuns; and so she hoped it might help to prevent any ill from coming upon him from the rising of the waters at the Pixies' Bath. But her heart was very heavy, and she could not altogether overcome her fears. Sir Henry set off on his journey, and rested that night at the Baron de Dinant's; but so little was he pleased with his host, or with some things that dropped from him in conversation, expressing his dissatisfaction with the king and the government, that he determined to go away the next morning as early as he could, and not to trouble Simon de Dinant with his company on his way back. The trial of Maurice, for aiding and abetting the robbers by stealing for them Sir Roger's sheep, came on before the court at Bodmin. Sir Henry with great patience heard the evidence on both sides, and having fully examined into the merits of the case, he summed up with perfect impartiality, and being convinced of the innocence of the accused the man was acquitted. Sir Roger de Stevenson, on finding what was the verdict, became greatly enraged, and more so when he learnt that from motives of charity Sir Henry had taken poor Maurice into his own service, in his original employment, as a page. Sir Roger's wrath knew no bounds. But he dissembled his real feelings, and appearing to be well satisfied, set off for London with a determination to lose no time in gratifying his revenge, and in working the ruin of Sir Henry de Bath. In private, therefore, he sought the king, and under a great show of love to his person and anxiety for his safety, pretended that he came, though with reluctance, to make known to him the treason he had detected in his former ward. Henry was startled at hearing such a charge against his favorite judge. But though naturally inclined to mercy, the king was of a weak disposition, and easily fell into the snare that had been so artfully laid for him. He gave credit to the most shameful falsehoods on the testimony of Sir Roger and his followers in evil. The king, now completely the dupe of these cruel artifices, determined that Sir Henry de Bath should suffer for his supposed disloyalty and ingratitude. He caused, therefore, the unfortunate judge to be summoned before Parliament, to give answer to the charges of corruption and treason. Conscious of his innocence, Sir Henry boldly came forward; but believing himself to be assailed by some strong and secret enemy, who had suborned a set of low villains to appear against him, he came not alone. He was attended by a noble company of knights and gentlemen from the west of England, who had frankly offered their services and their lives in defence of his innocence. Seeing how strongly he was supported, and how fearlessly he entered the Parliament, none who were to judge his cause felt disposed to run the risk of finding him guilty for fear of the consequences to their lives, for in those times, scenes of violence often took place in that assembly. The king, who was present, finding how daunted were all the members, flew into a great rage, and cried out with a loud voice, "Whosoever shall kill Henry de Bath, shall be quit of his death, and I do hereby acquit him." Having said this he immediately retired. Thus encouraged, the followers of Sir Roger de Stevenson would gladly have executed on the spot the terrible fate denounced against the unhappy man by the king. But fortunately Sir John Mansel, who was of the Privy Council,, was present, and now interposed. Saying to these violent men, "Beware what you do. That which our sovereign hath in his wrath commanded, he will be very sorry for when his anger is overblown. And remember the friends of Sir Henry de Bath are powerful as brave. Any outrage committed against his life, will be fiercely revenged upon his destroyers." This produced the desired effect; Sir Henry escaped the immediate danger, and was persuaded to go down to his house in the west, and there live privately till the wrath of his sovereign was appeased. All these particulars were speedily made known to Sir Roger de Stevenson. Greatly did he fear, that should Sir Henry obtain an interview with his royal master, when he was in a more temperate mood, to examine into the truth of the matter, there was every possibility that his own plots would be detected. He resolved therefore as the only way for safety to destroy Sir Henry before the king's anger could have time to cool; and especially before he could recall his words--that whoever might kill Henry de Bath, should be acquitted of his death, and that he did acquit him. De Stevenson consulted with his followers, and between them it was agreed to follow De Bath to the west of England, to seize him in his own dwelling, and to put him to death on the spot. These evil men bound themselves by an oath, not to desert one the other, nor to betray each other in the execution of this dreadful design. In the interval, Sir Henry, who had been on the point of marriage with a sister of Sir Arthur Bassett, when he was so suddenly summoned to attend the Parliament; now resolved no longer to delay the celebration of his nuptials. On his return home, he found old Mabel in great joy; for the Pixies' Bath was again dry, the waters having retired into the earth on the very day (as it appeared) that Sir Henry had been preserved from the wrath of the king. She expressed the liveliest sense of thankfulness for his escape. Nor was she less delighted when she found that the wedding was to take place in a few days, as if nothing had happened. The morning of Sir Henry's marriage with the fair Margaret Basset, was bright and sunny. With much state, and attended by all the knights, esquires, and ladies of the neighborhood, Sir Henry and Margaret, mounted on horses gaily caparisoned, proceeded to the church porch, where, in those days, the marriage ceremony was performed. Old and young greeted them as they passed along, and all the girls and children of the village ran before them, strewing flowers in their path, whilst, as they returned home, the bells struck up a merry peal to give them joy. A splendid banquet or dinner was to be served up to all the friends and followers of De Bath, in the hall of his ancient dwelling. His tenants, labourers, and the poor, were to be treated with an ox roasted whole in the park. Every heart was to have cause to rejoice in the marriage of the good Sir Henry, the friend of the rich, the benefactor of the poor. The harper, who made it a point to be present at every festival, was seated in the hall, ready to strike upon his harp an air of welcome, the moment the bridal company entered within the doors of the mansion on their return from the church. Mabel was busied bustling about, here, there, and everywhere, seeing that all was set right and proper at the great, long oak table, and scolding the maidens and the serving men, if the slightest thing was neglected or forgotten. John, the butler, was ready with his store of flagons of wine, ale, mead, metheglin, and hippocras, when there came a sudden cloud over all the mirth and revelry and business of the household. "By the blessed Saint Bridget!" exclaimed old Mabel, wringing her hands as she looked out at the haill door, "if the Pixies' Bath be not risen again, and see how it overflows! Yes overflows, as the bride and bridegroom be coming down the avenue of old trees, and in full sight of it all. O to think it should be so, and that on his wedding day! O my poor boy, my dear Henry, what will become of him! To think that I should have nursed him in these arms; and he to live to see this! O to think that it is possible a burial may follow hard on the heels of a bridal in this old hall." And so she went on lamenting and bewailing; and not a gentleman, not a lady, not a man, woman, or child of any degree there, on that day assembled, but shared in the old nurse's fears. All the mirth of the company fled. Sir Henry alone bore himself bravely, indeed cheerfully, as he endeavoured to raise the drooping spirits of his young and lovely bride, and to reanimate his followers and guests. Yet it would not do; every heart feared, all trembled for what was to come; nor were their fears the less because they did not exactly know what to fear. The omen of evil was so marked, and at such a time, there was no mistaking it. But notwithstanding all these apprehensions, the dinner, wines, and ale were so excellent and all so plentiful, that the company found they had not lost their appetites with their joy; and for persons in such a state of suspense and affliction, they all certainly played a very good part with the spoons and platters; for knives and forks, in those days, were used only by the carver, and not by those for whom he carved. Cups went round the board, and the health of the bride and the bridegroom was drunk with a cheer, notwithstanding all fears; and so potent was the ale, that some stout fellows, made very bold by it, offered to fight, if they could only see them, the Pixies themselves, or any of their friends and abettors; and the old harper, towards nightfall, got his spirits so raised by a full and flowing cup of metheglin, which Mabel had served to him with her own hand, that he struck the chords of his harp to a joyous measure, as if in defiance of all evil omens. On hearing this, some of the young men present, led out many a pretty maiden to foot it to the stirring music in the hail, and dancing began right merrily; when, suddenly, a cry was heard from the Pixies' Bath. Scream followed scream in the most fearful manner. All were struck dumb with surprise at the hearing of these fearful shrieks so near them. The harp was hushed--the men and maidens stood motionless in the midst of the dance--the bride turned faint and pale--Sir Malpas put down the cup untested that at the moment he was in the act of raising to his lips--Sir Henry looked surprised--the revelry ceased--all was so quiet that nothing but those cries of suffering could be heard in the hall. No one spoke; when Mabel, who trembled in every joint, exclaimed with an energy that seemed more than natural for one of her years, "That is the scream of Fontina; she never screams but for one thing. Before midnight, death will be in this place; and who shall say on whose head the stroke will fall!" "Fontina, Fontina, who is Fontina?" whispered many voices in the hall. "The spirit of the pool," said Mabel; "the Pixy spirit, and a most fearful one." The screams continued--the consternation and alarm now became general. Some proposed one thing, some another. At length the young men, brave in numbers as in ale, agreed to go in a body with lighted torches and to examine around the bath. Could it be a trick played off by any one to cause fear on this occasion? The screams were certainly very terrible; and if it were a spirit, could not Sir Malpas, who was a parson, lay it quietly at the bottom of the pool or in the Red Sea, so as no more to disturb the peace of the company. They then proceeded to the overflowing waters. All was still; not a creature was to be seen, nor a sound to be heard around the Pixies' Bath. Sir Malpas was now again appealed to; but he declared that he had not his books with him; nothing could be done without his Latin, and that he had left at home. Also, though ghosts and ordinary spirits, he knew very well, could be laid in the Red Sea, yet he had his doubts if it were possible or lawful so to deal with Pixies. He, therefore, very prudently deferred undertaking the work, till he could obtain more information as to how best to proceed with it; and drank off his cup of mead which had been waiting for him; and to make up for lost time he took another. This occurrence so completely broke what little there was of mirth and merriment, that the company one and all dispersed. Every body seeming anxious to get away as fast as he could; in order, as he hoped, to be out of the reach of death or danger which Mabel had said those terrible screams of Fontina announced to be so near. All was soon hushed; the hall was left cheerless; half-emptied cups stood on the board; whilst wreaths of drooping flowers, and expiring lamps and torches, told a tale of broken mirth and a suddenly deserted banquet. The doors were fast locked, bolted, and barred, and the watch set for the night in the gate-house, which stood at a little distance fronting the hall door. But the watch had taken too much ale, and speedily slept on his post. "Let some of you lead your horses forward--station yourselves so as to surround the house. Let no one escape from it. Give death to any man who would pass on. We must, however, if we can, secure this traitor before he comes forth. I will to the hall door, and demand instant admission to Sir Henry de Bath, on business of moment from the king. He will not refuse to see me. Do you, Sir John Fitzallen, and you, Simon de Dinant, stand close by my side, so as to enter with me. I may need support--he may struggle--remember, despatch him on the spot--the king acquits the deed. Now forward, and this night shall yonder old mansion know me again for its master; as in those days when I destroyed the foolish Pixies' Bath, and swept away the beggars that drank from its waters." So spoke Sir Roger de Stevenson, in the pride of his heart; and once more did he place himself at the head of his band of ruffians, to lead them on to treachery and murder. But he had not proceeded ten paces, when suddenly so thick a mist fell on him and his party, and all around them, that neither trees, nor house, nor his followers, nor even his own horse's ears, could he distinguish. Nothing could exceed the confusion into which they were all thrown. To add to it, two or three entrance paths to the woods were near the spot where this cloud fell so densely upon them; and the animals, not being guided by the rein of their riders with any certainty (for the men pulled, now one way, and then another), took their own road, and carried them all into the thickest and most intricate parts of the forest, instead of following the track towards the house. Sir Roger, by this strange chance left completely alone, was the only one among them whose intimate acquaintance with the place enabled him to keep the right road. Whilst he approached the Pixies' Bath, the most fearful shrieks issued from it. He was startled, but still moved on. The mist, if possible, increased; and the screams that now arose from the pool had in them something of exultation; it chilled and curdled the very blood to hear them. 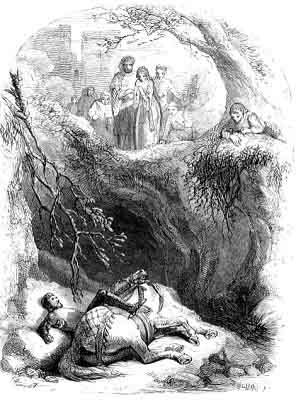 The young tenant who had heard Sir Roger address his men, and who, in a moment, understood how great was the danger of his good master, in the hope to be able to save him, and to give the alarm at the Hall, followed close, but unsuspected, at the heels of the horse on which Sir Roger rode. Unfortunately, when drawing near the Pixies' Bath, he stumbled over a stone; and, so great was the darkness, he could follow no further. Terrified, and not knowing what to do, or to fear, yet being full of fears, he sat down upon the large stone over which he had stumbled. At that moment he heard something splash into the water and a cry arose from it as if a hundred demons were rejoicing at the fall of a sinner. He heard no more, for be fainted, and knew not how he came to, or by whom he was found, when, on the next morning, Mabel was standing over him as he lay on a bench in the Hall. As soon as he was restored to his senses, and quite himself, he asked for a cup of ale, to refresh him. "A cup of ale!" exclaimed Mabel; "this is no time nor place for carousing. For, O look there! Look and see an awful sight, how wicked men meet their reward even in this world!" Well might old Mabel point with her hand in the direction of the Pixies' Bath; for there a fearful sight indeed was to be seen. There stood about it Sir Henry, and his young and beautiful bride leaning on his arm, and gazing upon it with looks of wonder and of thankfulness. Nearly all the household, also, stood around looking on. The a bath was now once more perfectly dry; the waters had retreated; but not before they had consigned to a terrible fate Sir Roger de Stevenson. It was supposed that, in the darkness of the previous night, the horse he rode had carried him into the pool, mistaking it for the path by the side. It was of depth sufficient in the middle to drown them; and there, in the very centre of that deep, and now dry, hollow pit, was seen, still mounted on his courser's back, Sir Roger de Stevenson--man and horse were both dead. The Pixies had, indeed, accomplished their revenge; but their bath never flowed again; and in a few years every vestige of it was destroyed.